Sealaska Heritage Institute (SHI) is partnering with Sitka National Historical Park to make a full-size, Native canoe in an effort to preserve the ancient but endangered knowledge of making the traditional watercraft known as dugouts. The project will be led by master carver Steve Brown, who will teach the canoe-making process to apprentices T.J. Young, Tommy Joseph and Jerrod and Nicholas Galanin, who also are accomplished artists. The institute began pursuing the project in earnest after artists who participated in SHI’s first Native Artist Gathering in 2015 ranked canoe construction as a high priority, said SHI President Rosita Worl. The mentor apprentice team working on the canoe project is one of three such collaborations SHI will sponsor through its Jinéit Art Academy, a program that is pairing mentors with apprentices in an effort to perpetuate endangered Northwest Coast art practices. SHI also will produce a manual on the project so that the steps are documented and made available to the next generation of artists. And, the institute will develop educational materials that SHI will use to teach youth about canoes through its art and education programs. Finely crafted dugout canoes have long been an essential component of Southeast Alaska Native culture. Until the modern era, dugout canoes served as the primary transportation method for trading, seasonal travel, hunting, fishing and gathering. 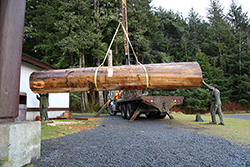 Sealaska donated a large, 28-foot red-cedar log, which will be transformed into a canoe in the carving shed at the Sitka National Historical Park. Brown and his apprentices will be on site from early February through May and accessible to visitors. The project is funded through a cooperative agreement with the National Park Service and in part by a grant from the Alaska State Council on the Arts and the National Endowment for the Arts. Worl also praised the partnership efforts with Sitka National History Park and Mary Miller, the former head of the Park’s Visitor Center, for helping to launch the project.